After a moderately sensible leaving party at Lower, I flew with our Kitza and Lower clients to Murmansk today where we were met by our second helicopter which brought in our guests from Middle and Pana. Murmansk on Saturday is always amusing with everyone keen to know how everyone else got on and swapping stories whilst meandering through the never less than interesting systems that they have in the airport. 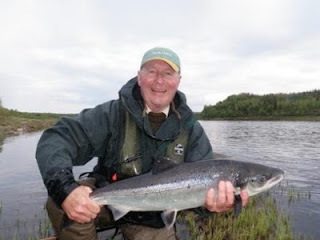 It is normally pretty busy up there but I did manage to speak to Sir Gordon L who yesterday landed a 25lbs fish from Pana which finished his week off in fine style. We all got to camp by about 5pm to be greeted by warm sunshine but with quite a stiff upstream breeze. 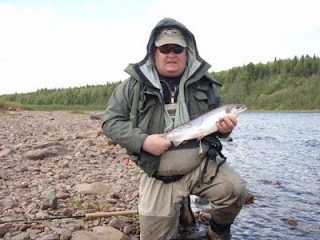 A few rods have raced to the river and I know that one of our Belgian guests has already landed his first Atlantic salmon so I hope it is a positive portent of things to come this week. Middle camp is looking stunning at the moment and I am looking forward to spending a week up here, and reporting some good fish being landed. 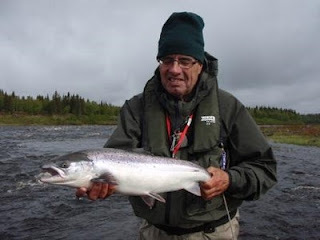 The final day of our fishing here at Lower Camp is upon us which seems almost impossible to believe. 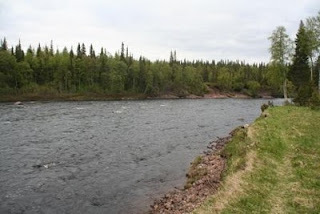 Kitza, Pana and Middle Camp will fish on, but sadly we will hang up our rods here this evening. 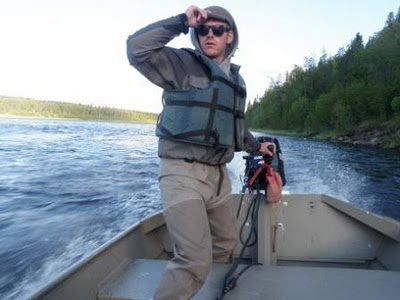 We have had a great season at Lower with lots of fish, fond memories, laughs and the odd hangover – exactly what a season on the Varzuga should be. Tonight we will get the boats out of the water and store them and their engines in our containers in order to protect them from the Arctic winter, before raising a glass or two to celebrate friendships made and memories shared. 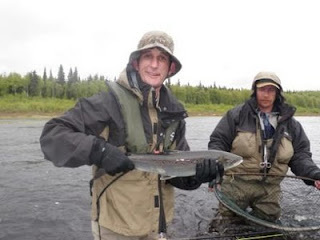 Yesterday was a better day across all the camps with Rob W and Mike T leading the way with 4 apiece from Lower, at Pana they had 23 fish with Jack M taking two fish out of the camp pool on a skater after dinner. Kitza had 13 and lost quite a few, Middle reported consitent fishing with another 50 fish to the 12 rods. 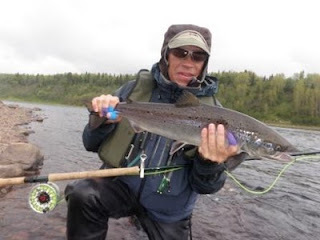 The weather is all over the place at the moment but this morning it is bright sunshine and it is really quite warm – a good day for fishing right on the surface, the guides all took monofilament leader with them this morning (rather than fluorocarbon leader - mono fishes skated flies much more effectively as fluorocarbon tends to sink). 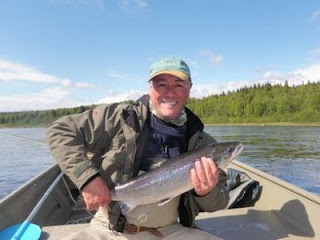 Tomorrow we head back to Murmansk for changeover day, next week I will be based at Middle camp where I look forward to meeting up with the great team of clients and old friends that I know are coming out. Sometimes we have to accept that the salmon will win on the odd occasion. Yesterday was one of those days and for whatever reason it was a tough day to catch fish. As you can imagine, we are not short on theories! 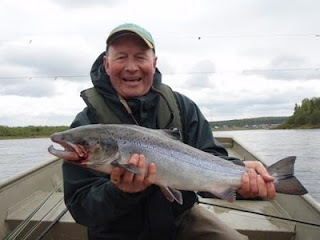 Here at Lower, Ian E was the top rod with 4 fish and at Middle the same number was landed by Egide de B, much to his delight, in amongst the 42 that the team had between them. At Pana they had 23 between them whereas over at Kitza, 13 were landed with our American friends showing everyone how it should be done. 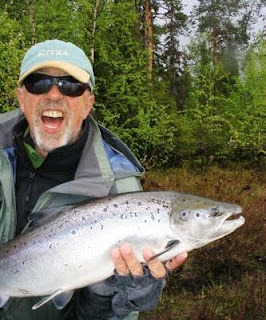 They went out for an hour in the morning, both caught a fish and then decided to call it a day – ultra cool was the word on the radio. After yet another feast from Jenna, our team here decided against fishing but Jessie, the manager, went out for an hour or so and landed one as well as losing one. He got a couple of fish to come to the skated fly but with our water temperature at about 8 degrees last night they were not totally committed. It is warmer now with a gentle breeze so hopefully the odds are now back in our favour and today will be a day where the rods come out on top. After 3 cold days we have got our summer back and today is warm, windless and feels much more like June. Yesterday provided a great day at Middle with the 12 rods beaching 71 fish; Hugo M had a very productive afternoon and took 10 fish to his own rod. At Pana they had 25 fish, all below camp but two rods are going to take the float trip today to see how many fish have got to the upper reaches which will be an interesting experiment. Last night we flew to Kitza to do the mid week changeover and we bought back 8 very happy rods who had taken 94 fish in their 3 days over there with fish caught around camp and at the top of the beat. 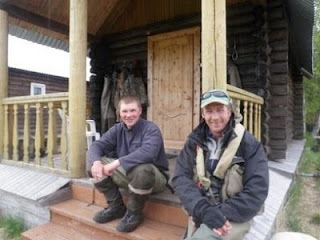 The very relaxed team who we took to Kitza had 41 fish for their time at Lower. 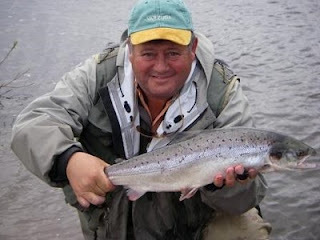 Yesterday afternoon the team here went to look around the village and then spent time in camp so the home pools are well rested for the rods that we have here now and Ian E went out for an hour or so after supper last night and landed two fish as well as losing two others. 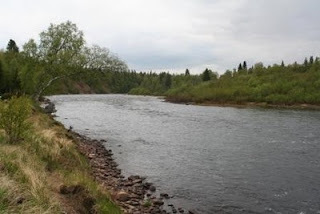 The water has now stopped rising and has pretty much levelled off without starting to drop yet and with the water temperature rising to 9 degrees this morning it is all set for a much nicer day to be fishing. The bright sunshine that I feared was coming our way has not materialised and yesterday was another cold and wet day. The water level is now back to where we were on the 26th May and it feels more like early spring than summer. 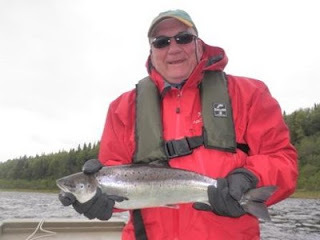 Our rods at Lower took 20 for the day with the highlight being Jerry W’s first fish which led to a celebration that was heard from here to Pana! I went to Middle last night where Donna cooked us a superb supper before a great fun evening developed with me learning Scottish as it was meant to be spoken. .. Nick M was very busy teaching our Belgian friends the finer points of deep frying Mars bars which led to a few bemused looks! 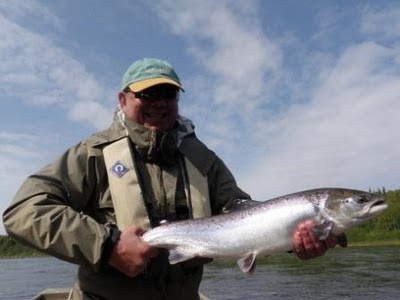 They had a better day yesterday with 53 fish landed whilst Kitza had 32 with Ian E and his son Peter leading the way with some excellent fish in the book. Pana had 21 but the major feature there was the size of the fish; Matthew P and Jack M each landed fish that were weighed at 17lbs and were as fresh as paint. The water temperature has dropped to 8 degrees this morning but thankfully the river appears to have stopped rising and it feels a more settled day today. This evening we will take the helicopter over to Kitza for the mid week changeover and I will try and take a few pictures of the river for those of you coming next week. The rain of yesterday has continued and its effects are being felt across the system. Here at Lower the river has risen 5 inches in the past 24 hours and my guess is that it has not stopped rising yet. 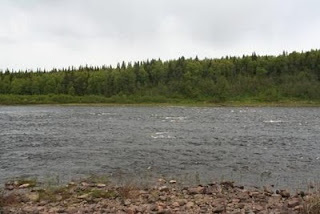 The rising river has certainly had an effect on the fishing and a pretty tough day was had across all the camps. 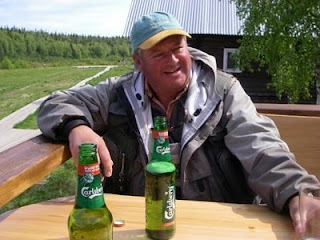 It is typical that we should wish for rain and then curse it – perhaps we should be farmers not fishermen? I will give the full figures tomorrow when everyone has come back in but a quick check on the radio revealed that Pana had around 20 to the 8 rods, Kitza 25-30 to 7 and Middle were around 40-45 fish to the 12 rods. At Lower we had a similar day but we had a day of many firsts. 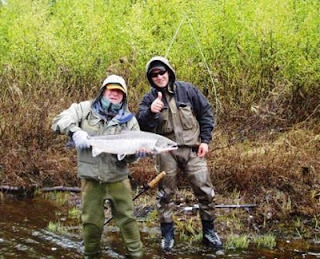 Peter L and Christian S landed their first Russian salmon and Tom W landed the first salmon he has seen in his life. All the way from Mississippi, Jerry W and his son Tom have been grinning ever since they got here, not allowing the fact that they had never cast a fly before daunt them. 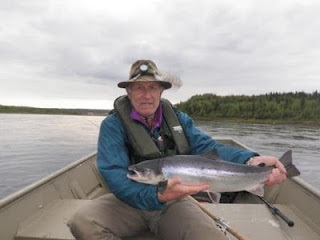 It was justice for their determination to enjoy everything set before them that Tom should land his first fish this morning and his second this afternoon, we are confident that Jerry will not be far behind. Sink tips, intermediates and 1 inch plastic tubes are still the best bets and whilst spring may have come early this year, it is not letting go easily and it was cold today with a biting downstream wind. Tomorrow is bound to bring bright sunshine and then no doubt we will curse that too!